Despite it still being summer, Chessington World Of Adventures and Thorpe Park have already started teasing what will be coming for their 2017 Halloween events. Unlike Thorpe Park, Chessington World Of Adventures have already released all the details about their 2017 Howl’o’ween event. Here are all of the mazes and experiences you will be able to do at this year’s Howl’o’ween event at Chessington World Of Adventures. In the Curse of the Lost Tomb maze, explorers are encouraged to delve into the secret lost tomb of Genghis Khan. Will all be revealed, or will the cursed tomb claim those who dare to enter? For those who prefer their scares a little sweeter. Younger Adventurers must choose which path they’d like to take past the bewitching tree – will it be a tempting treat or a troublesome trick?Enchanted fairies and ghostly goblins will guide little explorers on their way, with plenty of tricks and treats suitable for families of all ages. You can take a flight of fright on Vampire to soar through the trees of Transylvania, enjoy Dragon’s Fury’s spectacular spin underneath the stars, or incur the wrath of Rameses’ Revenge with Chessington’s favourite rides available to enjoy under the dark cloak of night. With over 40 rides and attractions, Chessington offers a world of excitement for the whole family to enjoy this Halloween. New for 2017 and with a ‘three bat rating’, Creepy Caves Unearthed is our scariest attraction yet. No one knows why the famous reptile and creepy crawly exhibit in the Zoo closed its doors at the end of 2016… until now. Secret Agents will lead you through the quarantined attraction for your exclusive look at the newly discovered plant species, found in the snake enclosure. But, with Zoo Keepers missing and strange things happening, who knows what powerful properties might be unearthed. 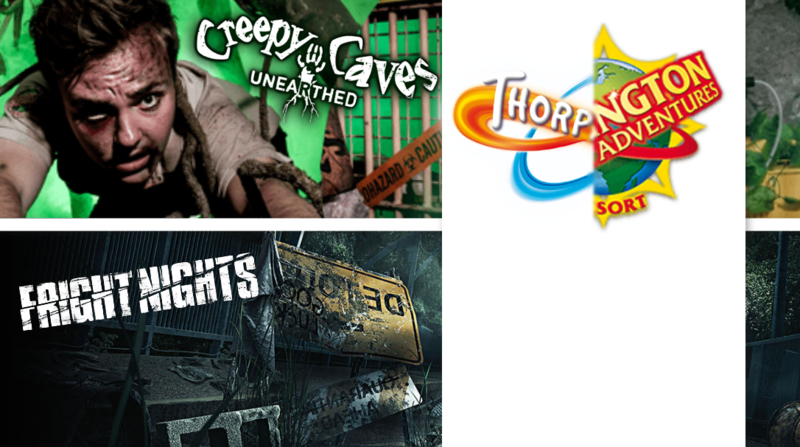 Thorpe Parks Fright Nights are expected to return this year bigger and better than ever before with a new global phenomenon heading to the park for 2017. Although the global phenomenon hasn’t been officially announced yet, it is very likely that this could be The Walking Dead! Thorpe Park has currently only shown one teaser image and a video on their social media accounts about their 2017 Fright Nights event. Are you excited for this years Halloween events?